Based on the critically acclaimed film of the same name, the much anticipated Made in Dagenham makes its West End premier at the Adelphi Theatre with Gemma Arterton leading the cast. Like the movie, the show is set in the late 1960’s and focuses on the strong female character, Rita O’Grady. Rita and her female friends work in a Ford auto factory in Dagenham. On discovering her and her colleagues not only earn much less than males in the work place, but that they are also in line for a pay cut, Rita decides that enough is enough. Taking a noble step, Rita embarks on a tricky fight for her rights as a worker, leading her to clash not only with the unions, but business giants Ford too. Unlike the film, the stage production of Made in Dagenham will be in musical form, which means a wealth of catchy numbers to keep the audience entertained! The original score for the show is provided by David Arnold, the long running Bond film composer. Lyrics are provided by Richard Thomas, who’s previous work includes Jerry Springer: The Opera. 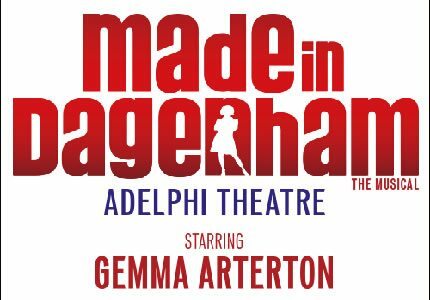 Made in Dagenham the Musical promises to be a treat for the eyes as well as the ears as Olivier Award winning designer, Bunnie Christie, provides the scenic elements to the show and respected choreographer Aletta Collins provides the movement. Adrian der Gregorian will star alongside Arterton, who found fame in 2008 when she starred in the latest film version of St Trinians. Arterton then went on to feature in Bond film, Quantum of Solace. The starlet was last seen in the theatre when she recently appeared in the Shakespeare’s Globe production of The Duchess of Malfi. Made in Dagenham is set to be both inspiring and comic at the same time, with the script created by One Man Two Guvnor’s writer, Richard Bean. Made in Dagenham features mild adult content and language. This show is not aimed at young children, but older children/ teenagers may be inspired by the powerful political message of the show.